Choosing the right sedan to get you from place to place around West Valley, Murray City, and Orem is an important decision that our team at Volkswagen SouthTowne wants to help you with. That’s why we’ve put together this vehicle comparison of the 2019 Volkswagen Jetta vs. Mazda3 to show you the differences that separate these two beloved vehicles! Under the hood of these two cars lie some powerful engines that will provide you with the acceleration you’re looking for out of a compact sedan. The horsepower in each vehicle is very similar, but torque is where the 2019 VW Jetta separates itself. Its 1.4L TSI® 4-cylinder turbocharged engine will give you 184 lb-ft of torque. On the other hand, the Mazda3 will only produce up to 150 lb-ft of torque. If you go with the R-Line trim level of the VW Jetta, an available feature is the Cross Differential System XDS®. This will provide you with more control when turning by applying brakes to the inside of the front wheels. Even with superior power, the VW Jetta made sure that didn’t come at the expense of a lower fuel efficiency. With 30 city/40 highway MPG1 to the mere 28 city/37 highway MPG fuel economy in the Mazda3, this Volkswagen will need fewer trips to the gas station. In line with the other technology advancements comes enhanced safety features in both of these vehicles. Whether you drive the VW Jetta or Mazda3, they both have driver assistance features that help you stay within your lane as well as detect if there is another car in your blind spot. However, the VW Jetta has a few extra features to help you remain safe. While both cars feature a Rear Cross Traffic Alert when backing out of parking spots, the VW Jetta also has Park Distance Control. This is extremely helpful when you’re trying to exit a parallel parking spot and get back on the road safely. 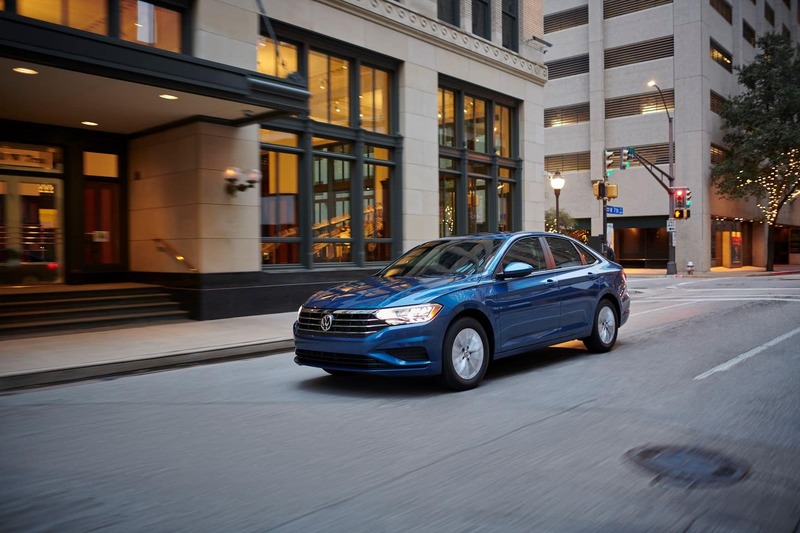 Come Test Drive the 2019 Volkswagen Jetta! Once you’ve reviewed this comparison of the 2019 VW Jetta vs. Mazda3, your decision should be clear. If you think the redesigned VW Jetta has the stylish look and premium feel you’re looking for, we would love to show you more about the car! Drivers near West Valley, Murray City, and Orem should stop in and see us at Volkswagen SouthTowne for a test drive of this sedan. You can also contact us online to learn more!